A useful / practical feature would be to (optionally) limit how close one can view a model. It would be particularly useful for models with image textures which always eventually look poor when too close. Also stops viewer from passing through models. I do realise that implementing this is possibly tricky, I imagine a forcefield computed by inflating the model by a certain distance. Or, a force field sphere around the virtual camera and an intersection test with model vertices. There are already Camera Limit features available. 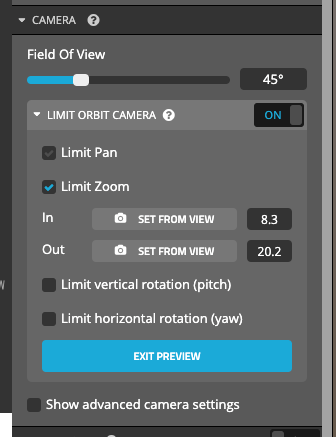 You can constrain zoom, rotation, and pan. We don’t have hit detection yet to stop the camera going through meshes, but maybe one day. It is range constraints I was suggesting … not just collision, although their implementation is probably related. I think that camera limits should allow you to do what you are trying to do. For example, in this models you can not zoom in to close on the paintings on the wall, so they always look nice and not pixelated.